Guests love spending time outdoors on ALEXANDRA JANE. Her flybridge has a large seating area and a bar, which is the perfect place to enjoy sunset cocktails and entertain. She also features a Jacuzzi. Alfresco dining is found on the main deck aft.The family friendly ALEXANDRA JANE’s interior is comfortable and luxurious. The salon bar is a perfect happy hour spot. The salon itself is well suited for fancy dress parties and popcorn movie nights. 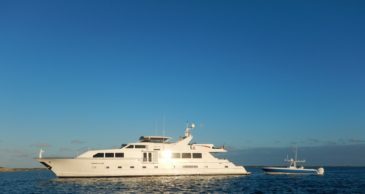 ALEXANDRA JANE is able to accommodate up to 10 guests in five staterooms. Her master suite is exceptionally spacious with a his-and-hers bathroom, Jacuzzi tub and shower; the VIP has a queen-size bed and en-suite bathroom and three additional twin staterooms each had en-suite bathrooms.